We have three days left! In this preview, we look at one section of the base. The Boiler served as the home of the hero Hot Water. This base was constructed using the Ideal’s Build-a-Base system and was designed by Hot Water for his personal use and as a gathering place for Ideal members around the Atlantic Ocean. Hot Water dubbed the facility “The Boiler”. It is a small facility consisting of two major sections joined by a tram system built into the ocean floor. Section One consists of a meeting room, a communications monitoring center, and guest accommodations. Section Two is primary power and the vehicle hangar for any arriving members. 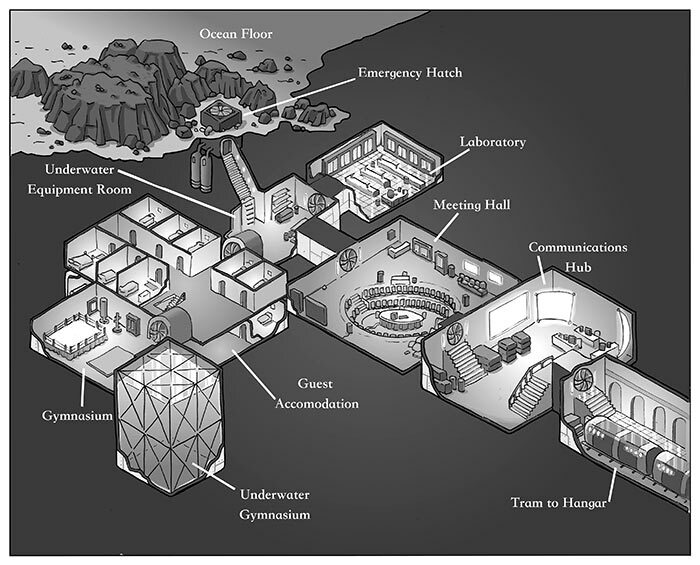 The facility is currently under Selachius control, but only just recently. Their efforts to seize the base have been hampered considerably by the octobots which inhabit the Boiler but increasing numbers have allowed the shark invaders to push in far enough to establish a foothold on the far side of the tram system and take control of the communications hub. The octobots have been scattered, some are still holed up in the hangar, others are hiding in the tram system, and some are in Section One, beyond the communication room. If you want to see more of this, please back our Kickstarter.